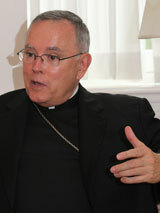 Archbishop Charles Chaput spoke with The Catholic Standard and Times’ director and general manager Matthew Gambino Jan. 19 about Catholic education in the Philadelphia Archdiocese. The interview came two weeks after the Blue Ribbon Commission’s recommendation to merge or close 49 Catholic schools. Q. Were you more surprised by the recommendations of the Blue Ribbon Commission or by the reaction of the people (to them)? A. I was surprised by the breadth of the recommendations of the Blue Ribbon Commission, as someone who hadn’t been in the Archdiocese from the beginning of the discussion. But also I’ve been surprised by the intensity of some of the responses. The response has gone beyond the natural anger and family concerns to hostility, even assigning bad motivation to members of the Blue Ribbon Commission, or to the pastor or to me. That’s really inappropriate to jump from being disappointed to being hostile and making rash judgments about other people. I certainly understand where it comes from, why the anger is intense. Yes, I was surprised. Q. The parents and school administrators are really on the front lines in terms of people hearing from them. What would you say to the students themselves, both in the Catholic schools and in the parish religious education programs, who are the ones experiencing the coming changes? A. First of all to the students in the schools, I want them to know that I understand why they don’t look forward to serious changes including being relocated, because their friends are together and they have a pleasant experience, the school is an “alma mater” which means a “dear mother,” and I certainly understand that. But also I hope they understand the fact that we have to pay teachers’ salaries and we have to keep our buildings in good shape and pay utilities and that costs money. For us to be effective in a school it means we have to have a school filled almost to capacity. We can’t have hugely empty schools and be able to afford it. So I would appeal to their common sense. Certainly everybody is on their side. I really want to keep all our schools open if possible but we have to deal with what is financially possible. Q. At the end of the Jan. 6 press conference you mentioned that if we had had school choice vouchers 15 years ago we might not be in this situation. A. Well we certainly wouldn’t be in the situation in the same way. I am especially concerned about the schools that are in the poorest parts of the Archdiocese where parents really can’t afford tuition. There’s just no way they can. We just have reached the point where we can’t subsidize those schools. But if we did have significant voucher support it would make all the difference in the world. I think we do provide a quality education at a lower cost than other systems and I wish we could continue doing that. But we can’t. Other schools will become in jeopardy over the course of time if we are unable to come up with a voucher system that works. It’s a matter of social justice, of helping the poor. They need a good education, and if we can provide it, why wouldn’t the broader community support a group that does it well? It’s universally acknowledged that we do this well, especially in areas where there is great poverty. We just need the resources to do it. Q. What could you say to motivate especially Catholics to get involved in the political process of advocating for important issues like this? A. I would tell them that they should be as passionate about this for the poor as they would be about their own personal concerns because that’s part of our Catholic identity: to be involved in the lives of those who are in disparate situations. Also in terms of self-interest, if our poorer schools have students who receive vouchers, that would make more money available for other schools. Instead of spreading this subsidy out over this huge area we would be spreading it to a much smaller area. That would mean families who come from lower-middle class or middle class financial situations would be able to afford Catholic education too, because there would be more subsidy available to them from the school itself. A. It would help immensely over the course of (time) – even immediately it would help them. Q. Is there anything else you would like to say to the Catholic audience through CatholicPhilly.com and The Catholic Standard and Times? A. I would like to say that Catholic education has an extraordinary history in the Archdiocese of Philadelphia. The decisions that we’re going to make are going to continue to make very good, solid citizens into the future. (The Catholic education system) isn’t going to educate more than 250,000 students as it did in the past because we just don’t have the resources to do that. Nor do we have the students who are asking for that kind of education. But we want to do it well. And we hope that the decisions that are made are going to make Catholic education sustainable for the next 10 or 15 years without any major changes. I can’t (and won’t) speak to the Galveston-Houston Archdiocese, but do appreciate your faith and zeal. However, you may want to “educate” yourself on our situation in Philadelphia before making such brash and dismissive comments. I bring up the personal inspection because it was promised by our local leaders and it is a claim they maintain. St. John Neumann created the first diocesan school system in this country in Philadelphia. If you’re looking for an explicit Gospel passage for schools you won’t find it, but that is no argument. Our school system has formed the bedrock for the Catholic community and continues to bind people in faith and friendship. Regarding Catholic schools needing to be run like a business, I can understand. However, name me a business that suffers low quality and poor customer service (to the point of criminality) that decided the key to longevity is to double-cross, retreat and abandon its remaining customers only to focus on much more highly competitive markets. It is not contraception or a birth rate that is leading to smaller attendance and lower donations. It is because the community feels betrayed and the Archdiocese’s answer is to run away and make calls for more blind faith. Meanwhile, we just uncovered that the CFO for the Diocese stole $1m over the course of the last couple years. I don’t understand the misdirection in steering the conversation toward public schools. Public schools have to take everyone and they are the default choice of parents that may not care one way or the other about their children. Public schools are also responsible for around 56 million children versus 2 million in Catholic school education. It was precisely their failure in serving Catholics that led to the creation of Catholic schools. I don’t excuse their misdeeds one bit. However, you’ll have to forgive me that I hold my Archdiocese to a bit of a higher standard, particularly the men and women of the cloth. There is genuine concern about the presence of God’s grace. You’ll find it in some of the parish priests and sisters, but there is nothing being done on the Archdiocese level to inspire belief. That seems to be a very “inconvenient burden” for the Church hierarchy. This Q&A demonstrates an out-of-touch Archbishop who passes the buck, deliberately misses the point and pointedly insults the remaining faithful. You talk about “inappropriate rash judgments.” I am personally familiar with three schools that never saw a member of the commission at their facility prior to the decision to close them down. You talk about students not looking forward to “serious changes.” For most, these will not be changes. It is the end of Catholic schooling for them. Most students cannot get to a school two miles away, let alone more than ten miles away in many instances. The fixation on school vouchers is purely silly. I would think you’re familiar with last August’s ruling by the Denver District Court Judge on the pilot voucher program in Douglas County, Colorado. The idea of vouchers for religious schools will meet an immediate legal stonewall. The political roadblocks will be immense, as well. Public schools in Philadelphia have their own funding issues. There is no money to hand over toward Catholic schools. Lastly, your appeal to “common sense” is absolutely insulting. The Catholic Church facilitated the abuse of children for decades and has been only grudgingly repentant. The Archdiocese seems to still struggle to implement effectively corrective measures. The shrinking rolls in our churches and schools are a direct result of the failure of our hierarchy and your response is to insult the people even further? The hierarchy of our diocese needs to atone for its transgressions and the situation calls for a true response that is geared towards genuine sustainability. The mansion on City Ave is not the only useless diocesan holding that could be liquidated to fund significant change. Building new schools in communities that already have superior public schools is not the way for the future. The first step should be to embrace the remaining faithful and serve them as God intended. This “blue ribbon” plan is not that. I am not the sharpest knife in the drawer but I fail to understand the correlation between inspecting schools and viability. There is a saying, “liars figure, but figures don’t lie”. Yes, Catholic Education has been a “part “of the mission for many years but never the emphasis. I don’t remember a gospel passage saying go out and establish schools in my name. Like it or not, with the loss of consecrated men and women to teach, (nearly free) Catholic schooling became a business. Maybe readersn missed the part about “smaller families”. Since Catholics use contraceptives as often as non-Catholics and abort fractionally less, there are fewer children to fill the schools. The consequence… less revenue to pay teachers and upkeep facilities. Not to mention, fewer religious vocations. Parishes are unable to continue compensating for the deficiency. Why? I admit, I don’t know the number here, but last I checked Catholics overall gave the least of any group about 1.2%. I agree it will be a shame if most children opt out of Catholic schools. Rather than the Archbishop’s problem I see that as a “parent” problem. If parents are other than “culture Catholics” children will remain in Catholic School. People here have been fortunate to have schools readily available. My children were raised in a part of the country with nine Catholic high schools—all private–serving 1.1 million Catholics, with little public conveyance. I can assure you transporting children to these required a tangible sacrifice of both resources and time. Regarding sexual abuse. Perhaps people should educate themselves on the topic before pontificating. Two books to consider are Double Standard: Abuse Scandals and the Attack on the Catholic Church and Catholic Priests Falsely Accused: The facts, The Fraud, The stories. Yes, some priests have committed grave sins and no excuse is acceptable. At the same time, I for one am sick to death of this being used as a bludgeon to destroy not only Christ’s Church but some of the holiest men I have ever known. Archbishop, one of the more important concerns is the publication of an annual financial report by the Finance Council of the Archdiocese of Philadelphia. The last one I see available on the Internet is from 2003 and this report does not include important financial information related to assets, holdings and real estate. When will the parishioners of the Archdiocese of Philadelphia receive such an annual financial report from the Finance Council?